We Eat Way Too Much Meat! It’s time for a little tough love folks. I will never lecture anyone about their choice to eat meat. Instead, my work is to educate and inspire my audience to use food as a vehicle for living a healthy and happy life however when I do feel a moral obligation to give some tough love because I feel we are sabotaging the chances of a bright future, I cannot sit idly by. 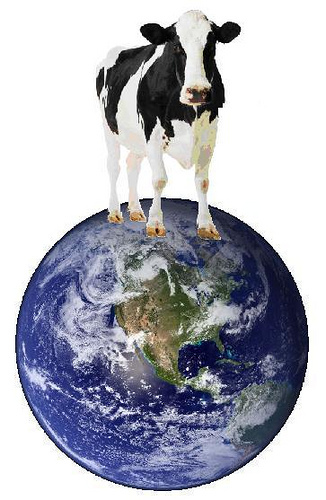 We know about the colossal land mass and other resources needed to raise animals for food and are shown the decay that happens to that very land and our precious resources like our water and air. We believe in climate change and understand that meat production is probably the largest culprit of greenhouse gas emissions as well as polluted water and degraded soil. We were warned about the enormous health risks attached to using antibiotics in our meat supply because of the threat of super bugs and the consequential ineffectiveness of antibiotics to cure even the simplest virus. We are witness to the emotional intelligence that animals have. We know that pigs are as smart as three year-old children and we watch videos confirming an animals ability to communicate, have personalities, a sense of humor and a deep connection to their babies and herd families. We have seen the videos of the cruelty that occurs in factory farms: baby chickens being stomped on, thrown into grinders alive, debeaked and living without open windows or light. Cows and pigs are kicked, living on top of each other in a state of shock, despair and fear while left to wallow in their own feces. We have seen videos of animals crying. But then we consume their despair, fear, terror and disease as if the burger or chicken sandwich we are eating is in someway separate from this reality. We know that claims like “all natural” and “grass-fed” are vague and unless meat is certified organic, we are eating what our animal ate – GMO alfalfa, corn, soy, meat by-products, refined sugar and all kinds of steroids, hormones and drugs. We have been told that Americans eat way too much protein as it is and that peas, broccoli, hemp seeds, avocados, nuts and pumpkin seeds are healthier choices for our bodies and our earth. We know the Department of Agriculture revoked regulations requiring imported meat to be labeled with their country of origin and so that allows it to be sold as a American product. We heard about cold cuts being doused in viruses to kill viruses, but that doesn’t seem to ring any warning bells for a lot of us and others just think Boar’s Head or Applegate are better options. But we don’t mind feeding them to our children. We tell ourselves that In-N-Out is better meat to make ourselves feel better about eating it but we know that any meat in a fast food restaurant should be avoided like the plague it is. We know about Peta exposing Whole Foods “happy meat” as being very unhappy indeed. We heard the World Health Organization declare that red meat and processed meat causes cancer. We know that big food and agriculture is concerned with profit, not healthy communities. We know food is heavily corporatized and politicized. We all know someone with cancer. But we still eat meat in any old restaurant, at any friend’s BBQ or party without thinking twice about what we are feeling in our bodies and know in our hearts. We still blindly trust “farm to table” “organic” restaurants even though nine out of ten times, they have been proven to lie outright to entice customers. We still choose immediate gratification like eating some form of animal product – beef, pork, poultry, dairy and eggs -at least once a day over what is right for the future of our children who will inherit this mess. Isn’t it time instead of knowing so much we actually do so much? How about committing to only buying meat directly from a rancher at a farmer’s market or not at all. How about promising to not eat meat outside of the home unless it is that rare dining experience we are looking forward to. It’s time we walk the walk. It’s time we stop trusting what people say and instead look at what they do. It’s time we listen more to our inner voice. Its time that our body, our kids, our animal friends and this planet is our priority no matter how time consuming, annoying or expensive it is because health comes first. It’s about time everything else comes second. Previous Previous post: My Five Favorite Foods For Glowing Skin. Next Next post: On Becoming the Crème de la Crème.